More than 50 years ago, with the flip of a switch and the turn of a dial, local television became an unforgettable part of New Orleans culture. For many viewers, the memories remain vivid, even if much of what they saw was in black and white. This collection of vintage photographs highlights the history of popular programs and personalities, beginning with the city’s first station, WDSU-TV. After signing on the air in 1948, Channel 6 introduced favorites like Mrs. Muffin, The Great MacNutt, and Midday while building a news team that included local icons Mel Leavitt, Nash Roberts,and Alec Gifford. In 1957, WWL-TV took to the airwaves, developing a reputation for quality local programming and dominant news coverage. Channel 4 made household names out of Morgus the Magnificent, Hap Glaudi, John Pela, Phil Johnson, Bill Elder, and Angela Hill. 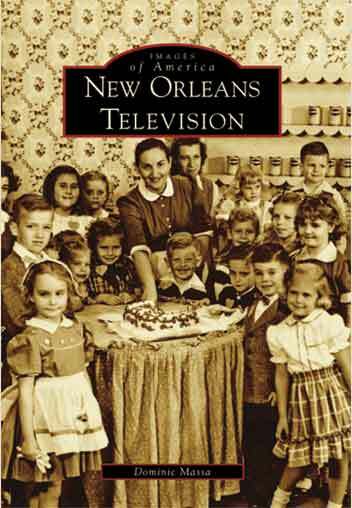 New Orleans Television uses close to 200 archival photographs to trace the history of local television from its earliest days in 1948, with memories of popular programs and personalities over the past 60 years. The memories remain vivid, even if most of what we saw was black and white. Topics include well-loved children's shows hosted by Mrs. Muffin, the Great MacNutt and "Uncle Henry Dupre", as well as must-see favorites Morgus the Magnificent, John Pela and Jim Metcalf. Pioneering news coverage by Alec Gifford, Mel Leavitt, Nash Roberts, Bill Elder, Phil Johnson and Hap Glaudi is remembered, along with memories of Midday, the fondly-remembered program produced and hosted by Terry Flettrich, and featuring Al Shea and Bob and Jan Carr.